More than 10,000 bears are kept on bile farms in China, and official figures put the number suffering the same fate in Vietnam at about 1,200. The bears have their bile extracted on a regular basis, which is not only used in traditional medicine but also in many ordinary household products. Our Kuma Korps - Jasper the Moon Bear design, was made to honor a rescued Moon Bear named Jasper. 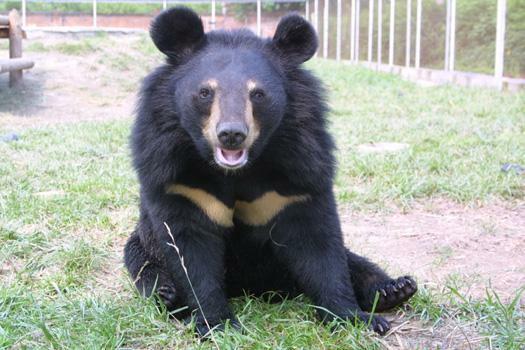 A portion of the sales will be donated to an organization called Animals Asia, who have spearheaded the effort to rescue Moon Bears from bile farms and move them to sanctuaries for rehab and to live out the rest of their natural lives. Embroidered, Velcro backed morale patch. Measures approx: 2.14" Wide x 3" Tall. Items are located and ship from the USA. This is a high-quality patch with a clear moon bear design. It is a great donation for the protection of Jasper the moon bear.